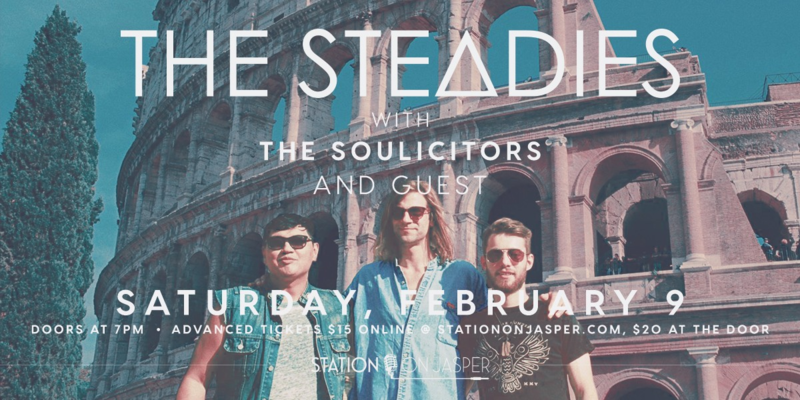 The Steadies are a high-energy power trio from Saskatoon SK Canada who mix pop, rock, funk and reggae creating a sound they’ve dubbed, ‘island-rock’. Frontman Earl Pereira is a 3-Time Juno nominee, 9-Time WCMA winner, was the bassist and founding member of multi-platinum band Wide Mouth Mason, and has toured opening for music icons The Rolling Stones, The Guess Who, ACDC and The Tragically Hip. The Steadies’ latest album release Love Revolution has received national radio play on CBC, nearly 100,000 online views, landed the band featured articles in Canadian Musician Magazine and Brooklyn NY based music magazine Punchland. Previous releases have garnered a top 50 hit on pop radio and a WCMA nomination. In May 2017 The Steadies completed a successful 17-date tour of China & South Korea and shortly after lost their guitarist and founding member Justin 'Juice' Lee to a tragic brain aneurysm. With help from their musician friends the band toured across Canada in honour of Lee calling it the For Juice With Love Tour. After the announcement of newest member, guitarist Jesse James Clark in September 2018, The ’new' Steadies headed overseas for their first European tour and completed a highly successful 6 shows across Italy, Austria, and Germany. A 20-date Western Canada Winter Tour and recording their third album is up next for The Steadies while targeting a Spring/Summer 2019 release.